I really like this one, with the duck set against the Osaka skyline at sunset. But why am I talking about a rubber duck installation on a food site? It's because the Rihga Royal Osaka hotel has introduced a Rubber Duck Plate to commemorate the event. It features an omurice (rice stuffed omelette) shaped like its much bigger cousin. And it is adorable. When I saw the image above, which has been on several Japanese news sites, I thought at first that the duck's head was a plastic one placed on top of an omelette, because it looked so perfect. I should have known better than to underestimate the capacity for creating edible kawaii-ness of Japanese chefs, whether professional or amateur. The head is also made of omelette! I think the eyes are blobs of "sauce", and the beak is made out of glazed carrot. On a kawaii scale of 1 to 10, I give it an 11. 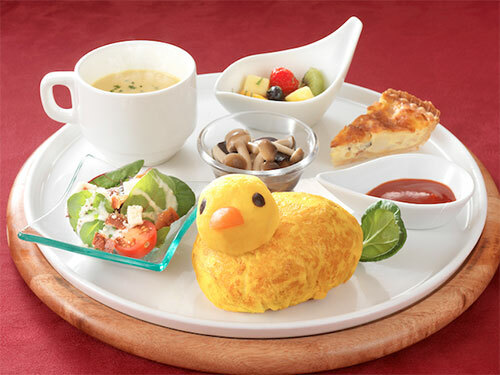 The Rubber Duck Plate costs 2,000 yen (about US $20), and is limited to 20 servings a day. It's available until December 30th at the All Day Dining Remone restaurant in the Rihga Royal Osaka. If you go and have one...I want to see your pics! Submitted by maki on 2013-10-24 19:56. I love it. Only in Japan would you find a duck dish - that's actually omelette. Super Kawaii. am I the only one more interested in the quiche and little bowl of stewed mushrooms rather than the omelette? You are an admirable woman. 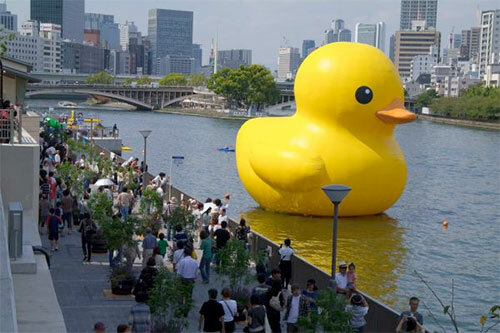 Inspire of your illness you still have appreciation and enjoyment of stuff like the rubber duck! I pray you recover well and restored more than you could ever imagine. I think it looks rather lovely as a whole. 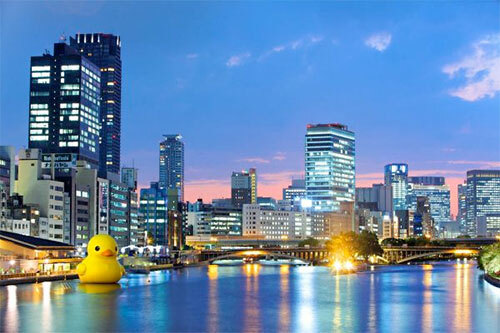 The photos are so beautiful, especially the duck set against the Osaka skyline at sunset. 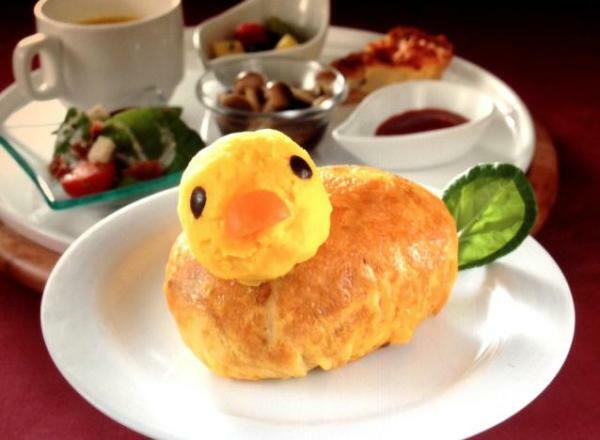 I have never been to Japan, but would love to go if only to have the omurice shaped like a duck. Beautiful photos and beautiful food! I have in-laws in Osaka but I haven't visited them for many years. My Japanese wife visited there a few years back but I had to stay here and work. As I recall the pace of life was faster in Osaka than in Tokyo and the food was wonderful. Of course the food is greater now because my brother-in-law is executive chef at one of the hotels. 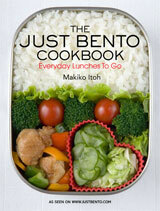 You are an inspiration to all of us who read your blog Maki. I have *got* to try that.. Though, considering how perfectly round it is I would do it with the yolk of a boiled egg - attached with a toothpick. So cute, with a little leaf for a tail . . .